Dog toenail drama. At the ripe old age of 10 Sophie has to put up with her mommie’s incompetence at dog toenail clipping. We used to travel a lot so we were at the vet’s pretty often getting paperwork in order. Sophie got her toenails clipped as a “value added” item. Now we are not traveling so much and her toenails were getting painfully long. Enter the dreaded toenail clippers. Years ago when Sophie and we were getting bonded as a family I thought I would just grab some dog toe clippers and snip, snip, snip all would be good. Drama. If you have ever had a dog you know the story. Clip just a little wrong and blood everywhere. I did not know about how easily and profusely dog toenails bled when accidentally clipped to the quick. That day we were sitting on the floor with her half in my lap both and of us wiggling making the clipping hard. I nipped the quick and blood went everywhere. I was distraught. I thought I was the worst dog-mommie ever. I had wounded my child and there was so much blood I was sure I had killed her. Some quick internet research showed how to stop the bleeding and that I was one of the millions of dog-mommies and daddies who had clipped too close without meaning to. Later I confessed to my Vet and she laughed and said they did it sometimes too. Still, I was pretty sure that Sophie and my days at the home pedicure palace were over forever. Sophie with cornstarch to stop the toenail bleeding and my hands all torn up from sanding and finishing floors. So last week with trepidation driven from our previous experience, and the irrefutable fact that her feet hurt because her toenails were too long, I took on the task. I clipped only a little at a time so both of us could get used to it. I don’t know which of us was worse at the whole project. I tried to make it a game and give lots of cookies. I managed two toenail tips the first time out and we have gotten braver each clip. I won’t say either of us are having fun but it has become a game. I get a clip and she gets a bit of cookie. I put the cookies out on the floor and it goes “clip” “cookie.” If I forget to give her permission to pick a bit of cookie up from in front of her after a clip she stares at me indignantly. If I pause in the clip-cookie game she holds her paw out to me. 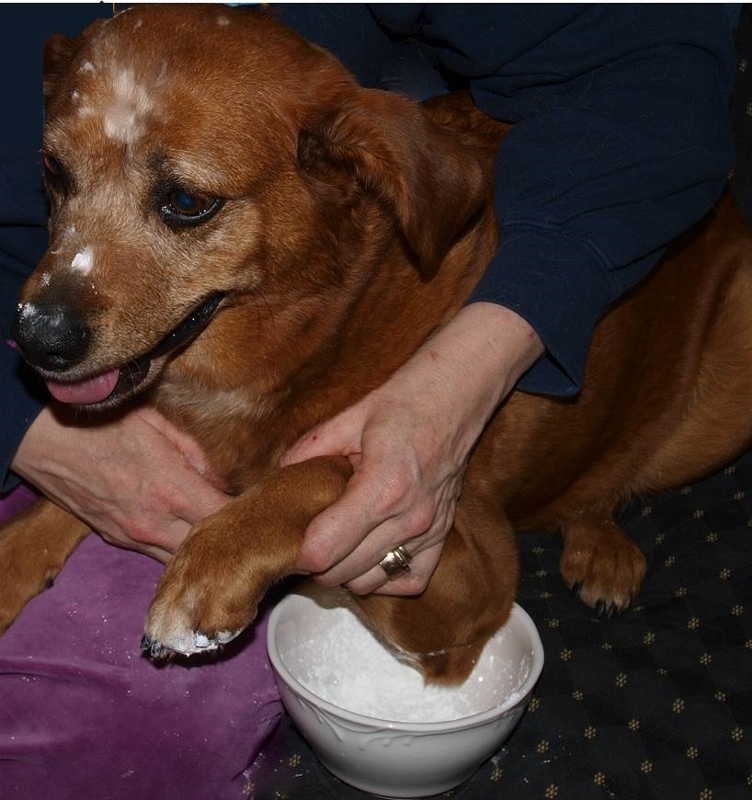 It was hard not to laugh at her when she stuck her head into a bowl of puffy cornstarch to investigate. I was holding her getting ready to tip her paw in and the snout went in instead. She found it interesting and cornstarch puffed everywhere. She drew back surprised and not interested so the toenail was rescued and all was good. Tonight the dog toe drama trumped the other dramas of the day. It was good to have a laugh and Sophie liked her cookie she got after the photo op for this blog. She and I both agree if being cool during a drama gets you a cookie, cool under fire is good.